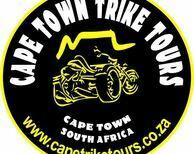 A romantic sunset trike tour for two to scenic Signal Hill via the Atlantic Seaboard. Please note that the Signal Hill sunset tour is not available over weekends and from Dec. 15th to Jan. 15th due to extreme congestion. For the romantic at heart, this is the ideal gift or activity to spoil that special person in your life. The tour starts with collection at the V&A Waterfront approx 2 hours before sunset. We ride through Cape Town, along the Atlantic Seaboard to Camps Bay for a stop to stretch the legs and for an opportunity to take a few photo’s. We then ride up onto Signal Hill where you will enjoy a bottle of ice cold sparkling wine and some delicious finger snacks (included) while you watch the magnificent African sunset over the Atlantic Ocean with Robben Island in the background. To complete the perfect day, why not combine this tour with one of our other tours...speak to us for a special deal.